It all began in 1908 when Henry Simon Winzeler started a manufacturing company in a rented band hall in Archbold, Ohio. Naming it the Ohio Art Company to reflect his lifelong interest in art, he set about producing metal picture frames and other novelty items to be sold to leading retail stores across the nation. In 1912, the company moved to Bryan, Ohio and had early success with the Cupid Awake/Cupid Asleep picture frames. That year Ohio Art also installed metal lithography equipment and began to produce wood-grained metal sheets, which were then formed into picture frames. Capitalizing on its metal stamping and printing capabilities, Ohio Art entered the toy business with windmills in 1917 and a climbing monkey in 1919. As the American toy industry grew during and after World War I, Ohio Art's toy production expanded to include colorful tea sets and drums. In the late 1950's, Andre Cassagnes, an electrician in France, stumbled upon the idea of creating a drawing toy with a joystick, glass and aluminum powder. Cassagnes called this early concept, the Telecran, which, through relationships with key business partners, made it's way to Winzeler. Winzeler connected Cassagnes with Jerry Burger, Chief Engineer at the Ohio Art Company, so they could collaborate and perfect the system. The system they developed in the late 1950s is the same system that is at the core of the Etch A Sketch today. Also in the 1950's, W.C. Killgallon joined the Ohio Art Company. Today the Ohio Art Company is still operated by the Killgallon family. In 1960, the Etch A Sketch went into production and the first one rolled off the Bryan, Ohio factory line on July 12, 1960. 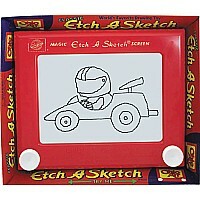 Today, with Etch A Sketch still one of the cornerstones of the activity aisle, Ohio Art proudly markets gobs of special toys including Magna Doodle, the original magnetic drawing toy. Magna Doodle was invented by four Japanese engineers at the Pilot Pen Corporation who set out to develop the first dustless chalkboard, a tool intended for the business world. The world embraced Magna Doodle, which, since 1978, has sold more than 65 million pieces.